Illnesses can impact your day-to-day routines. They can certainly make it more difficult to keep up with home maintenance. And so when you’ve recovered from a recent illness, you might need to spend some time cleaning the home and removing infected elements that could lead to a recurrence of the issue. 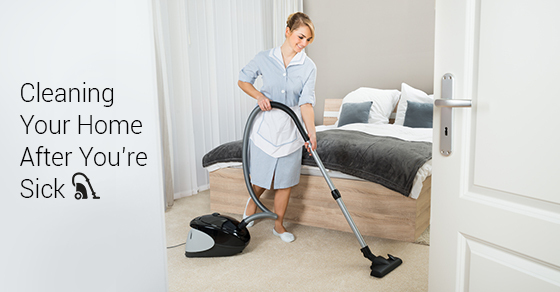 In this latest post, our cleaning experts provide their quick guide to cleaning after an illness. As you begin the cleaning process, you can start with the space in which you’ll be conducting the most important cleaning work – the laundry room. Be sure to give the surfaces within your laundry room a clean with a vinegar solution. And then, when all parts of the room are clean, you can take dirty laundry into the space and it in a hot temperature wash to kill any lingering bacteria that might be on clothes and bed linens. Tea tree oil is a natural antibacterial and antifungal agent and so can be exceptionally important during the home cleaning process after you’ve been ill.
To being utilizing the power of tea tree oil, fill a spray bottle with two teaspoons and two cups of water. You can then spray the air around the home to give your property a fresh scent. You can also use the liquid in the spray bottle to wipe down surfaces around the home and protect areas, such as kitchen food preparation spaces, from potential germs leftover after your illness. Many are surprised to learn that the surfaces we touch the most are rarely, if ever, cleaned. Consider for example the keyboard on your laptop, or the screen on your smartphone. When was the last time these areas were cleaned? To clean the keyboard, carefully unplug the product, turn it off and then shake your laptop to remove any loose debris. Then, dip a cloth in a small amount of isotropic alcohol and brush the cloth along the keys and computer surface, being careful not to drip any liquid as you do so. To clean your smart phone screen, first turn the device off completely and then dust the screen and the edges of the phone with a microfiber cloth. To learn more on cleaning your home after an illness, call our trusted cleaning specialists directly!